A combination of antique and modern, the subdued design of the Casio G-Shock Analog G-Steel Series Watch recalls a vintage motorcycle or rider jacket. 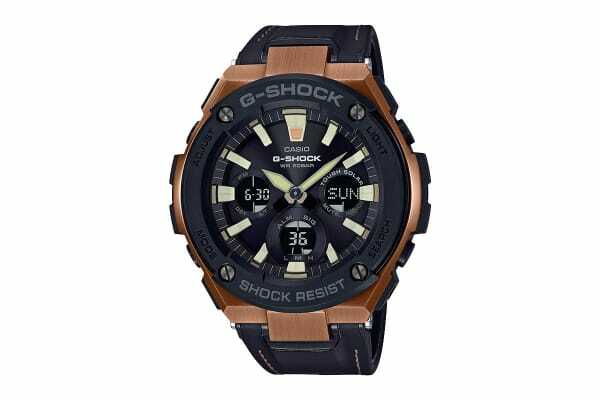 In addition to Tough Solar and a hand shift feature, the Casio G-Shock Analog G-Steel Series Watch features Neon Illuminator for the face and a white backlight for the digital display providing easy reading even in the dark. New “tough leather” combines resin with synthetic leather for a band that is water resistant and has better wear resistance and tensile strength. Distinctive stitching adds an authentic leather look, whilst the “layer guard structure” provides outstanding shock resistance.